I landed back into Heathrow yesterday (after a week dodging murderous bus drivers and seeing a friend in Sri Lanka) to an excited message in a client WhatsApp group. The message highlighted a huge jump in organic conversions, as a direct result of some laaavvvly coverage sorted by the team. 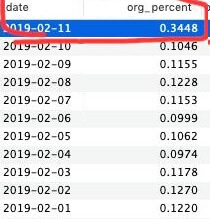 As you can see, the average organic percentage sits around 9-12%, based on February results to date. With a big bump from our earned PR work, that went up to 34%. Sure, it’ll dip again in a couple of days and until our next proactive story goes out, but that, for a client that already does big numbers, is a hefty uplift in terms of sales conversions, and it’s all, measurably, down to PR. Site visibility is up in a big way since we started working with them too, on account of the PR for SEO/link-building work we do with them. And that, in the long-run, could and should mean a drop in PPC spend for the most relevant keywords. If your agency is still telling you how much ‘PR Value’ you’re getting from the amount you spend with them each month, and isn’t able to point to actual tangible benefits, it might be time to reconsider your options. Want to know how we could deliver great PR campaign results for your company too?